I intended to make a beef roast with diced tomatoes in the slow cooker today. But had a little change in plans…I found a green tomato on the ground when sweeping through the garden last night. My first thought was to fry it up, but I wanted to do something different. I thought adding it in with the roast would bring a different flavor to the typical beef roast! I thought the roast with the green tomatoes was delightful! The slow cooked green tomatoes gave the beefy a perfect tangy flavor…very unique! So if you’ve got tomatoes growing in your garden, just take 1 large green one, slice it up and cook with a beef roast! You won’t be disappointed! I was pleasantly surprised by how well this little “food experiment” turned out! **Serve brown rice instead of bread for a gluten free meal! Add beef roast to slow cooker with 1/2 cup of water. Sprinkle roast with salt and pepper. 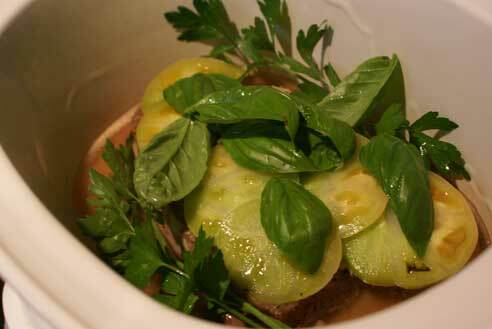 Lay green tomato slices on top of the beef roast. Add basil leaves and parsley over the tomatoes. Set slow cooker on low and cook for 8 hours. **Don’t want to heat up the kitchen. Put the slow cooker outside on the porch! Wash and slice squash into circles. Steam for 4-5 minutes in steamer or microwavable bowl covered with plastic. Wash and cut off stems from green beans. Steam for 4-5 minutes in steamer or microwavable bowl covered with plastic. Butter slices of sourdough bread and sprinkle with garlic salt. (I’ve been craving garlic bread lately!) I really think these would be better with jelly…but garlic bread sounded better to me tonight! 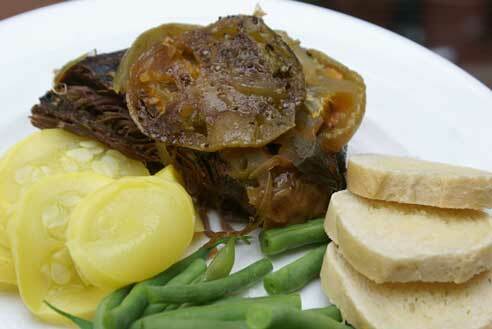 Serve Green Tomato Beef Roast with Steamed Squash, Steamed Green Beans and Bread. I have a gardening helper that understands that we pick tomatoes, but doesn’t understand we only pick them when they are red. This is a great solution to the tomatoes I have sitting on the counter that are never going to turn red. Thanks for the post! Looks great! Good save on the green tomato! I love how you can take something random and free/cheap and turn it into dinner. Most of us would have tossed the green tomato into the compost. Given a lemon, you would make something more exciting than mere lemonade. Hey, this is a neat idea! Can’t wait to try it! I have a question … dont laugh at me as I dont cook a lot. I have never cooked with fresh basil leaves and parsley. You put in the whole stems with the leaves. Does it cook down or do you remove it? All my spices are in bottles and I have been wanting to experiement with fresh spices. I usually just use the leaves. Last night I put in the whole parsley sprig, as I knew that it would get strained out. If I use a fresh herb in a sauce, I remove the stems and I’ll chop it up and toss it in. The leaves will cook down. I love how fresh and wholesome this is. You are daring to use that green tomato- kudos! It smells great! I love your recipes. You have inspired me to try my own hand at lowering my budget. However; this recipe was sounded so good that I didn’t care that the beef was over five dollars. $2.99 a pound. Great use for all those green tomatoes I picked after the frost.